Although I design and make quilts for a living, I still consider myself an adventurous beginner when it comes to sewing garments. I can put in a zipper and am a pro at hemming clothes, as any 5-foot-tall woman should be, but when I look at these bloggers who can take an old jean jacket and convert it into a totally cool bustier, I realize that I need to be a bit more adventurous. I found a barely worn Smith & Hawken linen dress at Goodwill for $4.99. 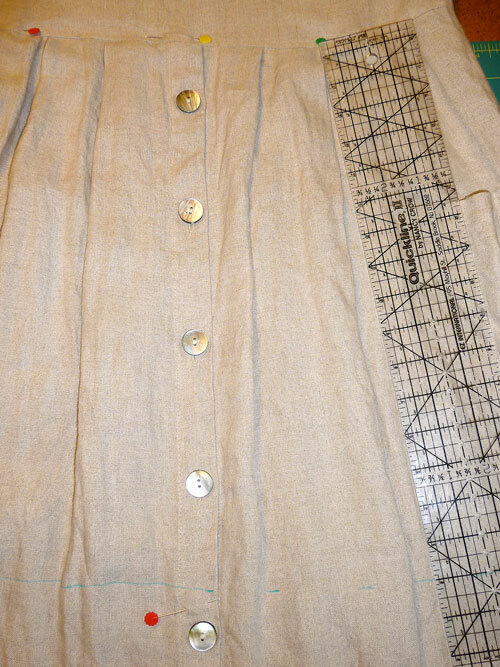 It was a high-quality fabric with nice buttons and was well made but, it reminded me a bit of one of the dresses Maria got from the convent and wore on her first day in the Van Trapp family home. If you’ve seen The Sound of Music as many times as I have, you know the dress I’m talking about. If you can’t recall the dress of which I write, forget the sewing and go watch the movie again. And while you’re watching it, take note of the baroness’ gold lame’ dress with the gigantic bow that she wears at the party and you’ll know my definition of glamour. Although, if you pressed me on it, it was Liesl’s flowing chiffon dress that she wore dancing with Rolf in the gazebo that remains the dress of my dreams. I can’t tell you how many times my sister and cousins and I sang “Sixteen Going on Seventeen” jumping from sofa to sofa at our grandmother’s house. “I just need the dress,” I always thought. Anyway, the linen dress was a bit haus frau for my taste and I wear nothing but tank tops in the summer so the sleeves had to go. 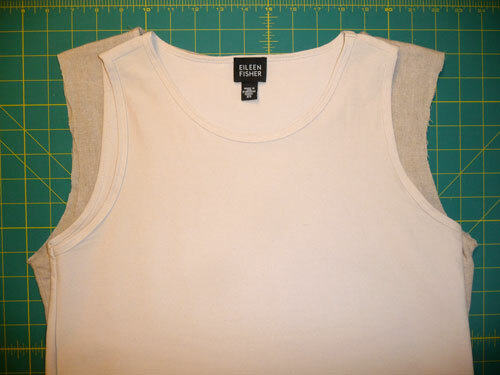 I carefully cut off the sleeves and put another sleeveless dress (a good-as-new Eileen Fisher dress also for $4.99 at Goodwill) on top of the linen dress so I could get a clue as to how to shape the arm hole. 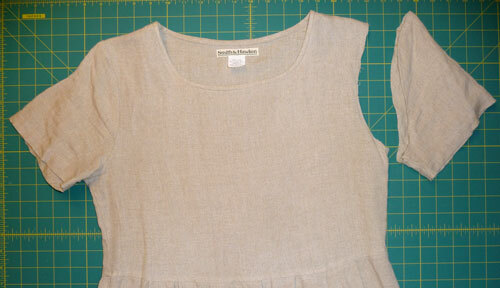 Using a wash-out marker I traced a line parallel to the arm hole line of the Eileen Fisher dress onto the linen dress. Then I rolled under the raw edges twice so I could topstitch a line that would look similar to the topstitching around the neck of the Smith & Hawken dress and keep the raw edges from fraying. Then I measured the existing hem of the dress before I cut off the extra length. I’ve learned through a lifetime of hemming garments that it’s often desirable to use the same seam allowance in the hem that the manufacturer used. 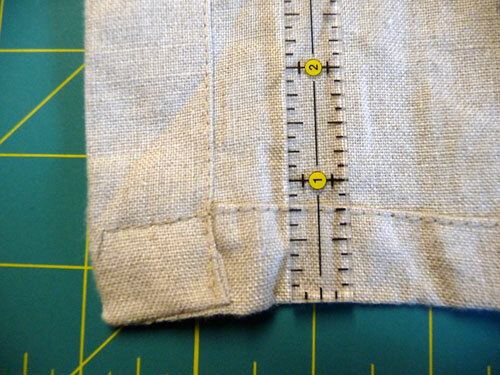 Making the hem too skimpy might make a linen dress curl up, while making a silk hem too wide can cause it to hang awkwardly if it’s cut on a bias. I may be giving manufacturers too much credit but I have a feeling they know more about how fabric drapes than I do. So unless I have a good reason not to, I generally try to mimic the way they have treated the hem. When hemming a really full skirt or dress I place the ruler perpendicular to the waist line and make a series of marks all the same distance from the waist line. Then I can just connect the dots to find my cutting line because with a full skirt the hemline will be curved. That’s a great reconstruction! I love how just a few changes made it go from frumpy to cute. And now you’ve got some extra linen leftover to play with – bonus! Adorable! I feel so proud when I can take something someone would throw away and turn it into something fabulous. Great job! Wonderful refashion! I wanted that Liesl dress too. It is a real pleasure for me to visit your web site and to enjoy your exclusive posts here. I like that so much. I can see that you paid much attention for those posts, as all of them make sense and are very useful. Thank you for sharing. I can be very good reader & listener. Appreciate your work!